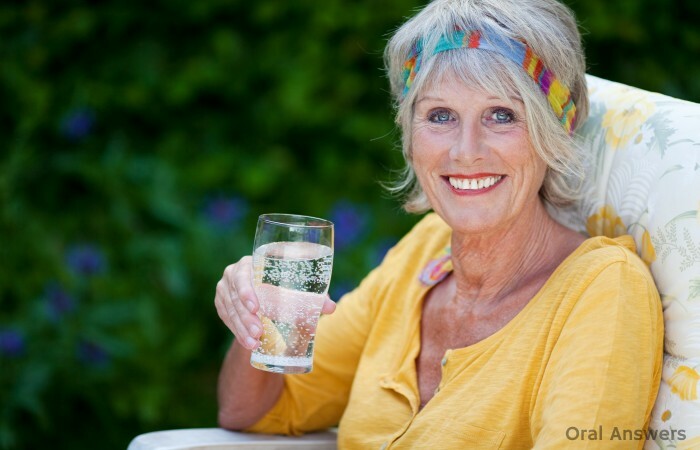 Home Food & Drink Is Sparkling Water Bad For Your Teeth? They took some extracted teeth and placed them in glasses filled with different types of flavored carbonated waters. They found that the sparkling water does eat away tooth enamel. In fact, they found that flavored sparkling water has as much or more of an erosive effect on teeth than orange juice, which is known to be very erosive to the teeth. In other words, sparkling water can erode your tooth enamel. It’s probably not something you need to worry about though, unless you drink carbonated water several times per day. Our saliva can repair the enamel through a process called re-mineralization as long as your teeth aren’t being bathed in the acid constantly. No need to worry, Alyssa! Sparkling water really isn’t too bad for your teeth when you compare it to regular soda pop and even a Diet Coke. In moderation, it shouldn’t do much harm. I wonder if the Carbonation in coke eats away your enamel (along with the phosphoric acid). in the study u only refer to flavored sparkling water & u seem to translate then to sparkling water is there any reliable study on plain sparkling water? How about unflavoured sparkling water, is that as damaging as the flavoured sparkling water? Hi Jess – I would think that unflavored sparkling water would be slightly less damaging to your teeth than flavored sparkling water simply because many of the flavorings that are added are acids, which aren’t friendly to our teeth! This study shows that flavored sparkling water definitely does eat away at the enamel on the teeth. Another study has shown that some sparkling mineral waters are around 100 times less damaging to the teeth than comparable soft drinks. It is important to keep in mind that sparkling water is less damaging than soft drinks and it is much healthier for your body than traditional soda drinks. I think that having it in moderation is fine, because our bodies are able to repair the teeth when they are slightly damaged from acidic drinks. I hope that helps, Jess. Thanks for your question! Bit of a misleading title, no? flavoured sparkling water is not the same as sparkling water. Hi Luke – The title simply asks the question of whether or not it is bad for your teeth. I wouldn’t call it misleading though. Although flavored sparkling waters are more damaging than regular sparkling water, I believe that non-flavored sparkling water also has a slightly negative effect on your teeth because the carbonation breaks down into carbonic acid, which is acidic. In any case, they are much better for you than traditional soft drinks that contain sugar and phosphoric acid. Thanks for your comment, Luke. Let me know if that clarifies things a little more. It really is misleading. Correlation does not imply causation. The data you present does not allow your readers to determine if the corrosive effect is a result of specific flavorings or the carbonation in the water. As a matter of fact, it seems like the carbonation is NOT the main contributor to the observed effects. Carlos, calm down & be nice. Are you kidding? Carlos is completely right here. The author talks about flavored sparkling water in his article, and then somehow concludes from that that regular sparkling water is corrosive for your teeth as well. The title is misleading and the author obviously does not know enough about the subject to be drawing conclusions about stuff like this. I’m not much of a fan of regular soft drinks, but I do like sparkling water, and sparkling water with juice -orange or cranberry -even more. This looks like the worst of all the possibilities, from what I read above. Is there anything I can do after I finish my corrosive drink to counteract the carbonic acid? Would rinsing with baking soda and tap water be a good idea? Hi Jim – As far as I know, you should be fine if you rinse out your mouth. I have heard some people say that you can use baking soda and water. I would think that as long as you rinse the acid away, then your saliva (which is basic) will take over and start to repair the enamel that was ever-so-slightly dissolved. How soon after drinking this should we brush our teeth? I believe I read it’s better to wait a little while, right? Hi Sierra – I have heard that you should wait anywhere from 30 minutes to an hour after drinking acidic drinks before brushing. I’ve tried finding a reliable source to confirm this, but haven’t found one yet. By simply rinsing your mouth out, you will get rid of the acid. Since most sparkling water doesn’t have any sugar in it, you wouldn’t really need to worry about brushing because you wouldn’t have given the bacteria in your mouth anything to eat, so they wouldn’t be able to grow and multiply. Another thing you can try is to chew sugar-free gum. The gum will cause you to produce more saliva, which can help remineralize the tiny bit of enamel that was damaged. I hope that helps, Sierra – Thanks for your comment! You don’t give a reference for your statement that “sparkling water is still very acidic”. The study you give a link to was very specifically for flavoured sparkling waters. How do you know that unflavoured water is “very acidic”? Hi Eve – Thanks for your comment! I probably should have clarified that a little bit more. When water is carbonated, carbon dioxide is dissolved into the water. Carbon dioxide can react with the water to form carbonic acid. It is this carbonic acid that makes unflavored sparkling water acidic. As for a source, in the book Modern Food Microbiology by Monroe it talks about the pH difference between carbonated water and non-carbonated water. It states, “The pH of non-carbonated water should be around neutrality, whereas that of carbonated water is typically between 3 and 4.0 – ideally at or below pH 3.5. Here’s a link where you can read that reference in context on Google Books. I hope that helps. Let me know if you have any other questions. Thanks for your comment, Eve! I drink plain water most of the time but I still like fizzy drinks too, so I started making my own carbonated “mineral” water a few years ago. All i do is add a pinch of sea salt and a dash of baking soda to a liter of filtered tap water and then carbonate it. Could the baking soda change the PH of the water at all? Hi Sherry – I don’t think that the salt would have much of an effect on the pH. The baking soda on the other hand is basic, so by adding it, you are increasing the pH and then by carbonating the water, you are decreasing the pH. Depending on the relative amounts of the carbonation and baking soda, the water could be either basic or acidic. Adding baking soda should definitely make the water more friendly to your teeth. I hope that helps. Let me know if you have any other questions. Thanks for your comment, Sherry. Initially, I noticed that the study from Uni of Birmingham (Brown 2007) which you reference & link (again, thank you) in your article “Is Sparkling Water Bad for Your Teeth” (posted 4 Jn 2010), tested only flavoured sparkling waters. This study is much older, but seems to say that in spite of the acidic numbers given for (unflavoured?) sparkling water in the Modern Food Microbiology book, unflavoured sparkling waters are for some not yet determined reason significantly less erosive to human teeth than flavoured sparkling waters. . .
How do you understand this information? Hi Eve – Thanks for sharing that study. Soft drinks are by far the worst for your teeth, then come flavored sparkling waters (due to the acidic flavors added), then unflavored sparkling water, and then regular water. I would say that flavored sparkling waters are only worse due to the acidic flavorings that are added. Although the carbonation does make any drink more acidic, it looks like it may not be acidic enough to do too much damage to your teeth. I would definitely advise to drink soft drinks sparingly, but I don’t think that sparkling waters pose a great enough threat to your teeth to really bother changing your drinking habits. I’m glad it helped, Manfred. Thanks for your comment! Thanks, my enamel is wearing and I was trying to find out why, your article was very helpful. HI Duncan – I’m glad it helped. Gastric reflux is another cause of tooth erosion. Your tooth can also wear away by grinding. If you’re more curious about why your teeth wear away, you can read this article: The Four Ways Your Teeth Get Worn Down. Thanks for your comment, Duncan! I drink 2 liters of sparkling water a day. Is that not moderation? Hi Sergio – 2 Liters does seem like a lot. The main factor is how much time it spends in contact with your teeth. If you drink through a straw, you could obviously drink a lot without it really affecting your teeth. You might find this article helpful: How to Drink Soda Pop and Keep Your Teeth Happy. While sparkling water and sugary soda pop are very different, there are some similarities. I hope that helps – Thanks for your comment, Sergio. Let me know if you have any other questions. My husband only drinks seltzer at home, at least one 1L bottle daily. My 13-yr-old daughter is now following his habit. I’m concerned about calcium loss and especially lack of fluoride. I’m trying to get them to drink plain (NYC) ice water, but not having much luck. I’ve been buying either Poland Springs lemon flavored or Trader Joe’s lemon flavored. Now it seems that at least I should buy the plain one. Should I be concerned about their teeth? Thanks for the info.! Over time, the acid may start to wear down their teeth. It is a gradual process. You might want to have your husband talk to his dentist to see if he has any effects of dental erosion in his mouth to see if is affecting him, if not it may not be too much of a problem. It’s a lot better to drink seltzer than it is to drink soda pop. I hope that helps, Susan. Let me know if you have any other questions. Thanks for your comment! Please note the specific qualifier, “Flavored”… I have done some reading on other sites and the negative effect doesn’t seem to apply to plain unflavored seltzer which is all I drink anyway. Good point, Lee – Thanks for your comment! Why do you consider on a study made on extracted teeth? You should know that things taken outside behave differently from things inside the mouth and the organism in general. Hi Alex – I’m not aware of any studies that show the effect of sparkling water on human subjects. It would be a tricky study to conduct since the effect on the enamel would depend on the overall diet of the person and not just how much sparkling water they drink. Thanks for your comment. humm.. i’m in trouble. i’m totally addicted to Perrier, drinking more than 2L/day (actually, that’s the only water I’ve been drinking for a couple of years now). I’ve noticed some corrosion on my teeth (bottom) … but I cannot stop drinking sparkling water (much better than the regular one). Any suggestion on how to compensate this acidity from the Perrier? This article is misleading just like the previous comment stated. FLAVORED sparkling water has sugars and other crap in it…the study WAS NOT conducted on sparkling water…you can hypothesize all you want, but the bottom line is your not a scientist. I checked out your link to the study and couldn’t even get a full version of the study, just the abstract, which your readers would have appreciated if you did a full study. Still keep up the marketing work, I’m sure it’ll come in handy once you become a dentist, I just hope you don’t end up lying to your customers. Hi there – The flavored sparkling waters I referred to above are unsweetened, such as Perrier and all of the unsweetened seltzer water found at your regular grocery store. My intent was not to mislead anyone, I just wanted to provide the results of a scientific study so that people can make informed decisions about their oral health. Of course, flavored sparkling water with sugar is the same as soda pop and is not good for your teeth. Unfortunately, I am unable to publish the full study since I don’t own the copyright. Thanks for your thoughts. I found this link: http://nutritiondiva.quickanddirtytips.com/is-carbonation-bad-for-you.aspx which contradicts much of yours. I do think that flavored carbonated water isn’t the best choice, but plain seems to be a safe bet. Hi Robyn – The Nutrition Diva doesn’t really contradict this article. We both cited the same study from the University of Birmingham which I quoted above. They do warn against consuming too much flavored sparkling water. She also cites a study about carbonated mineral water, and I probably could have made a better distinction between those in the article above. Evidently, the minerals in the water can help offset the acid. Thanks for sharing that, Robyn! San Pellegrino has a ph of 7.7, hardly acidic. You can easily find non acidic sparkling water, people just need to read the label. The pH should be displayed. If you read the label of most soda water you will find it contains sodium. The sodium is there because a neutralising agent was ALREADY added at manufacture. This varies by manufacture so unflavoured soda water could be anywhere from mildly acid to mildly alkali. So I am not surpised you report San Pelligrino as 7.7. I should add that can happen naturally in a spring also. In mineral water the minerals can be neutralizing. I looked for this answer because I have been on a weight loss program, wanted and need to lose a few pounds, and I never drank a lot of pop anyway. But I decided I would try carbonated water just to spice it up a little from just “plain” water. ;-)) However, I have noticed my teeth, in the last 2-3 weeks, have been incredibly sensitive. I had a sense that the carbonated water may be the culprit…at least to some degree. Anyway, I’ll discontinue drinking it and see if there is a change. Thanks! Does plain seltzer contain floride? Hi Barbara – It most likely does contain trace amounts of fluoride. To get a general idea of how much fluoride that popular bottled waters contain, you can read the post: How Much Fluoride Is In Bottled Water. Thanks for your comment! The real problem is not sparkling water but the horrible diseases that dentists cause with their poisonous materials. Dentists have very high rates of cancer and other degenerative diseases. They also have the highest rates of suicide. So folks, stop worrying about drinking sparkling water and start worrying about your dentist. Oh and google failed root canals, very common, and see what havoc these cause. Hi Steve – I’d love some facts to backup your statements. The medical field does have a higher rate of suicide and I think that has to do with the long-lasting results of decisions that we sometimes have to make fairly quickly. The key point is that it is “flavoured sparkling waters” which are significantly erosive to dental enamel. Plain sparkling waters although do erode enamel the level at which they do is not deemed to be a significant factor. From the 5 mins i spent looking this up online. Top tip use a straw when drinking acidic/fizzy/sweetened drinks. Or pound a big gulp of cherry coke and add extra sugar to it with loads of ice and crush it real hard with your teeth like i do. While eating a ton of fizzy sweets. Not sure why everyone’s criticisms of this post just reiterate previous comments… if you bothered to read through the discussion first you would find that the same points have been made several times. Thank you! Very helpful! Much appreciated. I am an American living in the UK and what isn’t clear on this page is that flavored sparkling water in the UK is almost all sweetened. This sweetening (real or sweetener) must be contributing to the teeth decay problem. It is very difficult to find sparkling water that has only a hint of fruit flavour and no sweetener (such as Poland Spring or Vintage Seltzer which are both available in New York). Please bear this in mind when considering these results. I am not a scientist but I am sure this is worst than American seltzer and other unsweetened sparkling drinks. Perhaps you are not a scientist – but you can learn much from British teeth! What about Ferrarelle? It is a naturally carbonated water, by the volcanic minerals in roccamonfina mountains (Naples, Italy). Do you think the effect could be less? Actually I’ve read that it’s the flavoring in flavored sparkling water that is corrosive, not the carbonation itself. I’d be curious to see this experiment done with plain, unflavored seltzer instead. Perrier without the lemon flavor I *believe* is not harmful. Damn! I guess I will have to start shaking my Perrier before I drink it! What about plain water with carbonation from a Soda Stream? That would be slightly acid due to the dissolved carbon dioxide. Traditionally seltzer water or soda water as we call it in the UK has things added to it to neutralize it so you may be better off with shop bought soda than from your soda stream – unless you neutralize it yourself with bicarbonate of soda. Either way it is much less acidic than flavoured soda. Look up “Soda Water” on Wikipedia for the facts. Discussion always helps an article. This article is a much needed advocate of drinking sugarless, phosphoric acid-less and colorless water drinks. When looking at it in perspective one would do themselves a big favor (including their teeth) by drinking sparkling water vs. soda pop. Soda pop is terribly bad for you on so many levels. Once you ditch the sugar for aspartame or other synthetics you end up polluting your body. So I’ll state here what the writer would not, due to his impartiality – – – “Do drink sparkling water”. Imagine if the developed world would advocate water (in all its forms) how many people would be able to wean themselves off of the great evils of other more harmful drinks. So many find themselves at the plain water – soda pop crossroads when they need not be. Plain water may not be a reasonable alternative to the strong taste and mouth/throat feel of a soda pop. To lessen the affect of any corrosive substance upon the teeth one would simply lessen the time it is in contact with them. So the best advice would be never to extract your teeth and soak them in anything for too long. I found upon drinking unflavored Seltzer, it makes my system work better. I’m drinking White Rock seltzer, which says the ingredients are Triple Filtered Carbonated Water. I’m going to call them to ask what they use to carbonate their seltzer. I have been drinking all my drinks through a straw from the time I was a small child. It is better for the teeth and gums. I do no drink soda, because I don’t like the taste and besides it causes you to retain water, just like salt. I drink Stop & Shop spring water and also Rite Aid Spring water, both come from the springs of God’s country, PA. Poland Springs taste dirty compared to the 2 I mentioned. CVS makes a spring water which taste worse than Poland Springs. When water is really clean it taste really good, with no after taste. I drink fresh juice like carrot, vegetables & fruit, etc., which I juice myself. I also drink Green Way Organic Almond Milk, Tropicana O.J., which I usually dilute with one 1/2 Spring water to 1/2 juice, otherwise it is to sweet. The same with blackberry, blueberry, cherry or cranberry juice. I only use 100% pure juice, or fresh squeezed juice. I drink green tea, sometimes I buy Lipton ready made teas Green w/Lemon or Brisk 1/2 tea & 1/2 Lemonade, which I also dilute. All the things I usually dilute, except for the fresh vegetables I juice. I brush with a different toothbrush each time I brush my teeth. I have a sterilizer, which I clean my toothbrushes with, once I have gone through all the clean brushes. I clean all them once I have used all the clean brushes. I also use ORAmd to brush my teeth, which has only Almond, Spearmint and Wintergreen oil in it, this was developed by a dentist. It is better for the gums and teeth, than the toothpaste and mouth wash on the market. There is so many chemicals in toothpaste, that alone is bad for the enamel on the teeth and gums. You don’t have that bad taste in your mouth the next day, after brushing your teeth with this toothpaste which is liquid. 3-5 drops in 1-2 oz of water makes the mouthwash. I wouldn’t be without it. Organic things are much better for the teeth and gums. Carrot juice is very good for the gums, it’s full of beta carotene. Tom, you need to read more on what is in the toothpaste that you get in the stores. I have been researching this for about 2 years, it’s what’s in the toothpaste, mouthwash and breath freshens that bad for the gums and teeth also. It’s not just the seltzer and sparkling water. 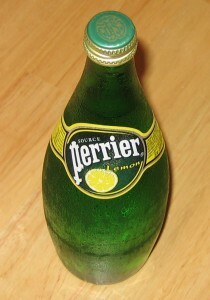 I don’t happen to like Perrier, I think it taste funny. It is way over priced to. San Pelligrino has a pH of 7.8 and because of it’s very calcium content it is good for your teeth. This article should be corrected. His bottom line is that fears of carbonated water eroding tooth enamel are misleading. The flavoring added to it, rather than the carbonation, is the culprit, yet the real culprit is all the sugar and artificial sweeteners that are added to soda. Just drink carbonated water with natural flavoring and you’re completely fine. To stop drinking carbonated water because you read internet sources quoting studies that confirm its allegedly detrimental affect on tooth enamel is comically stupid. Noticing teeth sensitivities. Doing research on possible causes. I do consume sparkling seltzer water with no flavor or sugar regularly. I am adding 2 oz of 100% white grape juice at night. Sometimes I will have more than 1, not often. Due to stress and habits-consume candy regularly and coffee. I am understanding that this can lead to erroding of enamel and internal staining of teeth. I have a small chip on top of lower middle teeth. Sensitivity. I drink plain sparkling seltzer water regularly everyday. I use in place of diet cokes. I grew up on junk food and sodas. When I lost weight-let go of diet cokes and artificial sweetners. I am reading mixed reviews on seltzer water. I do notice I seem to be sensitive today consuming just the selter water. It gets boring just plain water all the time. I don’t add sweetners or sugar to it. No artificial stuff. Just 2 oz of juice at night normally. Oral Sci) titled “Etiology of dental erosion-extrinsic factors” by Domenick Thomas Zero states on page 166: “the carbonated beverages were less erosive than the fruit-flavoured drinks”. However, the paper that is being quoted by Zero was published in 1958 (im assuming there is new research by now stating that it is the other way round?). Zero then states that another article using a rat model found that “carbonated orange drink was found to be the most erosive…. Of note was that these findings did not correspond with earlier rat studies and results from in vitro studies”. Would you please be able to help with this? I did an alkaline strip test on my Pellegrino sparkling water this morning. It was between 6.75 and 7. Which means it tested alkaline. My own tap water tested way down in the acidic range – 5.75. So, how can this sparking mineral water brand be worse on my teeth than my own town drinking water which is filtered with a Multi-Pure water filtering system? Please answer, as I plan to buy much more of it at my Co-op – if my assumption is correct. I reread the article and you keep mentioning flavored waters and never clearly state that some plain sparkling mineral waters are safe. 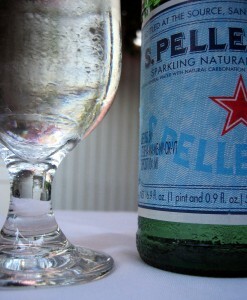 As said in my previous comment, Pellegrino is very much alkaline – more so than my own tap water.